One of the greatest joys we can have as Christians is the joy of leading someone to Christ. Think of it! You and I can be God's instruments in the salvation of our friends and relatives and others. Why is it so important to tell others about Jesus? Because the Lord Jesus is the Savior—the only Savior. Those who trust Jesus as their Savior will live forever with Him in Heaven. Those who die without Christ will live forever in that terrible place called hell. Who can have this wonderful privilege of winning others to Christ? Any believer! 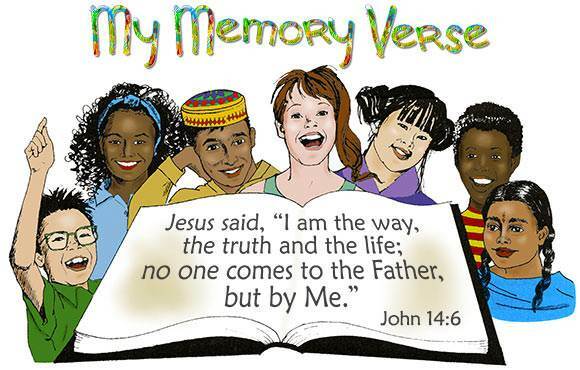 Every child of God can have the joy of introducing someone to the Lord Jesus. The Bible says, "…he who wins souls is wise" (Proverbs 11:30). In this lesson we will learn how to do this. "I am the way, the truth, and the life: no one comes unto the Father, but by Me" (John 14:6). To lead a person to Christ, you must use the Word of God in explaining the basic truths of the gospel. 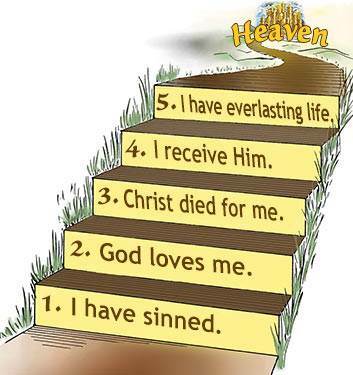 It is helpful to think about these basic truths as "steps to salvation." In explaining these steps, find each verse in your Bible and ask the person to read the verse out loud. The first step in leading someone to Christ is to show him from God's Word that he is a sinner. Open your Bible to Romans 3:23, and ask him to read this verse out loud. Ask, "What does this verse say to you?" Be sure that he sees from God's Word that he is a sinner. Explain to him that the punishment for sin is "death." "The wages of sin is death…" (Romans 6:23). This death means being separated from God forever, in the lake of fire. Find John 3:16 and ask him to read this out loud. Ask, "What does this verse say to you?" Ask him to read it again, with his name in the verse: For God so loved ______ (his/her name) that He gave His only begotten Son that ______ (his/her name) believing in Him should not perish, but have everlasting life. Find Romans 5:8 and ask him to read this out loud. Ask, "What does this verse say to you?" God loves sinners! God is saying to us, "I know all about your sins, but I really love you and I gave My Son to die on the cross for your sins." Christ died for you and me. You can say, "Christ died for MY sins!" Ask your friend to say this out loud: "Christ died for MY sins!" Find John 1:12. Ask him to read this out loud. Ask, "What does this verse say to you?" Explain that you become a child of God by receiving the Lord Jesus as your Savior. "Lord Jesus, I know that I am a sinner. I believe that You are the Son of God, and that You died for my sins. I need You and I want You to be my Savior. Please come into my heart. I am taking You as my Savior right now." Turn to John 3:36 and ask him to read this out loud. Ask, "What does this verse say to you?" Explain to him that God is talking about two groups of people—those who believe on His Son and those who do not. If he is in the group that believes on the Son, what does God say about him? God says, "You HAVE everlasting life." You know you have it because God says so! There are people all around you who need to be saved. Begin now to pray for them and watch for an opportunity to introduce them to the Lord Jesus. Do not be afraid of making a mistake. You will make the biggest mistake of all if you do not try to win them to Jesus Christ! A good way to get an opportunity to talk to someone about Christ is to ask, "Do you mind if I ask you a personal question?" Most people will answer, "No." Then you can ask, "If you were to die tonight, do you know for sure that you would go to Heaven?" If a person is not sure, you can ask, "Would you like for me to show you from the Bible how you can be sure that you will go to Heaven?" 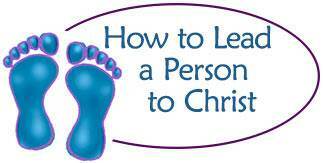 You may be a new Christian and you are wondering what you can do. You do not have to wait many years; you can serve the Lord now! You can tell others what Christ has done for you. You can tell others about the D+J Mailbox Club, and you can get them enrolled by giving them this website address. "They that be wise shall shine as the brightness of the firmament [the sun]; and they that turn many to righteousness as the stars for ever and ever" (Daniel 12:3). We need to be reminded that we have "Only one life; it will soon be past. Only what is done for Christ will last." 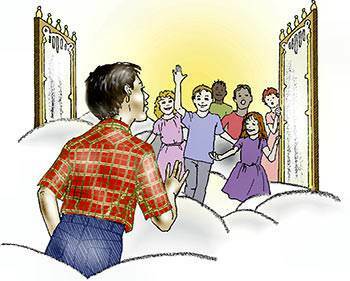 It will be GREAT JOY to enter Heaven, to see our precious Savior face-to-face, and to hear Him say, "Well done, good and faithful servant! Enter into the joy of your Lord." To meet many whom we have introduced to the Lord Jesus will be JOY MULTIPLIED! 1. 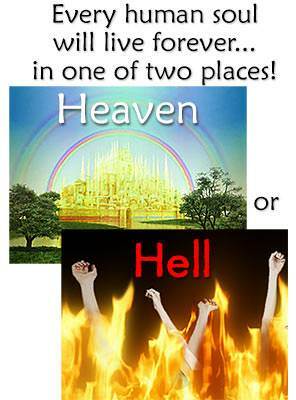 Every person will live forever in either Heaven or hell. 2. Believers will live forever with Christ in Heaven. Those who die without Christ will live forever in hell. 3. Soul-winning is introducing others to Jesus. Every believer can have the joy of winning others to Christ. Christ loved people enough to give His life for them. Do you love others enough to tell them about Christ? "Father, help me realize that every person will, one day, be in either Heaven or hell. Help me love people enough to tell them about Jesus. 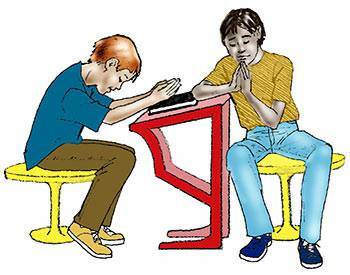 In Jesus' name I pray." Jared told Carlos why his Bible is his Secret Sword and how Jesus gives us strength to make right choices. Carlos told Jared he is going to help Alex fix a raft by the river. Jared was ready to dash off on his bike toward the river when he saw Beth waving excitedly from her window. When he hurried into her room she said, "Oh, Jared, I am so glad you came. Dan was just here looking for you. He said you should go to the river near the old bridge. The guys are planning to push Carlos out on the raft alone, before it is fixed." Jared's heart sank. He said a quick goodbye to Beth, jumped on his bike, and peddled furiously. Alex had chosen the meanest thing anyone could do to Carlos. Whether Alex knew it or not, Carlos had a brother who had drowned in a boating accident, and Carlos was terrified of the water. He would never get into a boat, and certainly not on a half-finished raft. Jared understood why Carlos wanted to leave the guys the minute the raft was fixed. Carlos felt safe if the raft was not ready for the water. When it was fixed, Carlos wanted to be far, far away. Jared turned off the main road and onto the trail that would take him to the river. 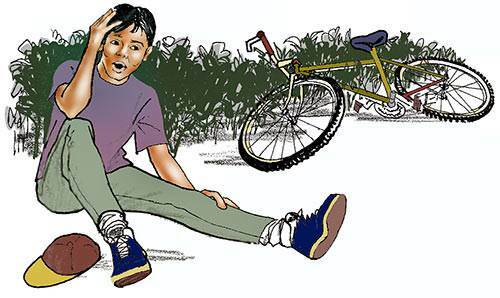 All of a sudden, his bike went out of control and he crashed into a bush. "Oh, no!" Jared groaned as he saw his ruined tire. There was nothing to do but leave his bike and find Carlos. He quickly hid his bike behind some bushes. Then he started running to the river. As Jared raced down the trail, he wondered how many boys he would find. He hoped someone might help him stand up against Alex. Soon he heard voices. Jared slowed down and kept under cover as much as possible. He crept closer and closer until he could hear what was happening. He parted a few branches ahead of him and peeked out at the boys. Jared saw a couple of the boys holding Carlos as Alex came toward them with a rope. 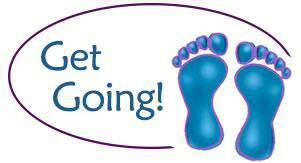 "What are you going to do?" Carlos asked in anguish. "We haven't finished the raft yet, and we had better hurry because I have to get home." "Oh, Carlos, don't worry," Alex told him. "The raft is good enough for what we want to do now. We always play a little trick on each new member of our gang. We want to see if you are brave enough." As Alex spoke, he began to tie Carlos' hands together. "Let me go!" Carlos yelled, trying to free himself. "I don't want to belong to your gang." "Yeah, I thought so," Alex growled. "We figured you were about to run back to your preacher friend. 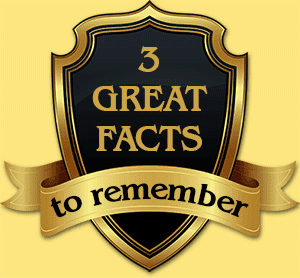 We want to do something that will help you remember us. Since you worked so hard on the raft, you can be the first to try it out." 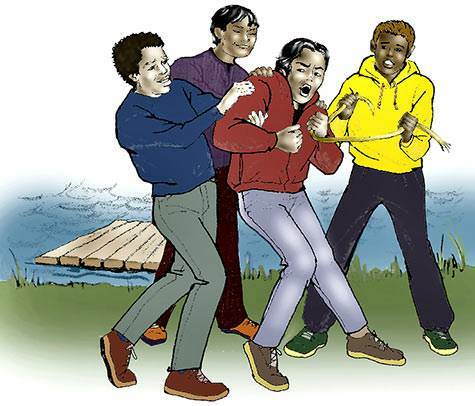 Carlos turned pale as the boys began to pull him toward the raft. "Let me go!" he screamed. "I can't swim and I don't want to go on the raft." Jared leaped out of his hiding place and raced toward the boys. He grabbed Alex and yanked him away from Carlos. "Alex!" he shouted. "You leave Carlos alone. Don't you dare put him on that raft!" Alex looked startled, but he quickly recovered and yelled back with fury, "Hey, guys, get that Preacher Boy and hang on to him!" Jared struggled but he was no match for the other boys. They soon had him held tightly while Alex and another boy put Carlos on the raft and began to push it out into the water. "Carlos," Jared called out. "Don't be scared. Help is coming any minute. Just hang on!" Alex let go of the raft and turned toward Jared. "What do you mean? Who else knows about this?" he yelled. Before Jared could answer, there was a splash as someone dove into the river and swam toward the raft. Jared sighed with relief as he recognized Dan. With one hand Dan began to guide the raft toward the riverbank. Filled with rage, Alex started toward the raft. 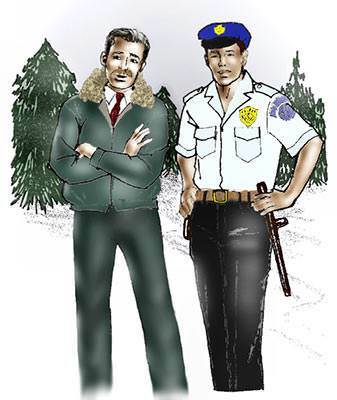 Just then Mr. Foster and a policeman stepped into the clearing. Some of the boys began to run, but the police officer called out, "Hold it, boys. Things will go a lot easier if you tell me what is going on here, than if we have to chase after you. Which one of you is Alex Simons?" "Right there," Dan pointed at Alex. "He's the leader of this gang." Dan gave a final push to the raft, which put it onto the shore. "It's okay now, Carlos," Dan encouraged, as he helped Carlos off the raft. Jared pulled himself away from the other boys and ran toward Carlos. "Are you all right?" Carlos nodded as Jared untied the rope around his hands. The policeman and Mr. Foster herded the frightened boys down the road where another police car was driving into the parking area. Dan helped put Jared's bike in the trunk of his father's car and then he and Jared sat beside Carlos. No one spoke as they drove off. What will Carlos do now? 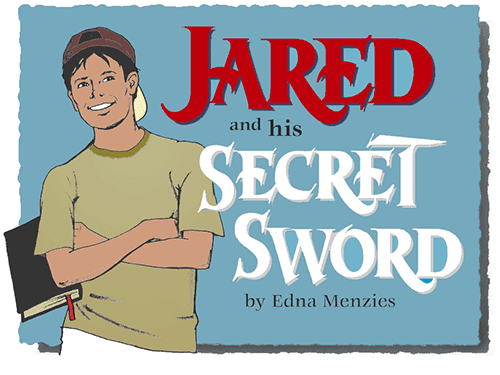 Don't miss the exciting conclusion to "Jared and his Secret Sword!"